Food – For The Common Good ???? One thing that has become clear to me over the years is the importance of striking a balance – if you stop and think for a moment, the traders and the food stalls at the festival can be as much part of our festival experience as the music, talks or the theatre. We need the right people offering good choices and we need a wide range to suit all tastes…but at the same time we need to remember that for these traders this is their livelihood, their work, so we have to ensure a fair chance for them to make it work. Greenbelt relies on the income generated by ‘selling’ pitches to help fund the creative content at the festival but if we just went for the “stack ’em high” approach that some events take to catering outlets – with row upon row of burger and chips, and stalls full of cheap plastic tat – well, it just wouldn’t be Greenbelt! We need the right people to choose us as much as we need to choose the right people, by building long-term relationships with our family of traders and caterers (many of whom have been part of Greenbelt for decades now) which give us each year a solid bedrock to build on. Last year we welcomed Sammy and the team from Pomorola Pizza to Greenbelt for the first time. Being relatively local to Boughton, he brought his young family with him, and they loved the event so will be back with us this August. We’re pleased that the team from The Incredible Bakery (again very local to Boughton) are coming back for their second year bringing a range of allergy sensitive meals and options. For those looking for something a bit different we’ve got Loving Hut Express joining us for the first time offering vegan food. Another newcomer to Greenbelt, adding another flavour to choose is Jonny Cake – if patties, salt fish or dumplings are your things then Clive and his team will be serving up traditional Caribbean staples. If like me you need a regular cake fix, then the new stall that Gemma from Cambrian Organics is bringing might help fill that brownie shaped hole – just look out for The Pudding Wagon. We’re delighted this year to welcome, for the first time, Northfield Farm, from just up the road in Oakham, who’ll be meeting our meaty needs. Two generations of family farming and butchery bringing their homegrown and homemade dry-cured bacon, sausages, and burgers. 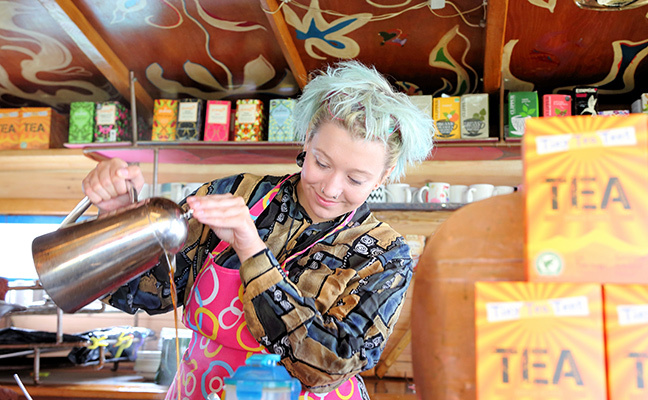 We’ll still be seeing many of our regulars too – Tiny Tea, Goan Fish Curry, Le Grande Bouffe (look out for Le Petite Bouffe in the campsite too if you can’t wait for your morning crepe! ), Tibetan Kitchen, Lalitas, Le Café Crepe, Roaming Rotisserie, Jonny Baghdad, SeaCow, wedges, doughnuts, coffees, sweets, fruit salads, and on and on… so much to chose!! Don’t forget the 24 Hour Kindred Cafe over in the Campsite Hub too. We’ll see also see a new hog roast stall from MEATSmiths (‘Purveyors of Porky Perfection’). We expect a lot from our food traders – what they sell, where it comes from, how it is prepared and how it is served. This year we’re pushing a little further. All the caterers on the site are being asked to use compostable plates, cups, cutlery etc. This means that rather than losing tonnes of waste to landfill we can take all the food waste together with its packaging and send it away for composting! Another feather in the cap for Greenbelt’s already strong environmental credentials. We’ll need your help to make this work, so look out for info on site and be sure to use the right bins! The traders and caterers on site are an essential part of Greenbelt’s ecosystem – as you’re enjoying the festival this year look out for our regulars and any new faces… and give them the welcome that you’d expect from a Greenbelter! Finally – if you’ve any specific dietary requirements, we’ve a list here to help!